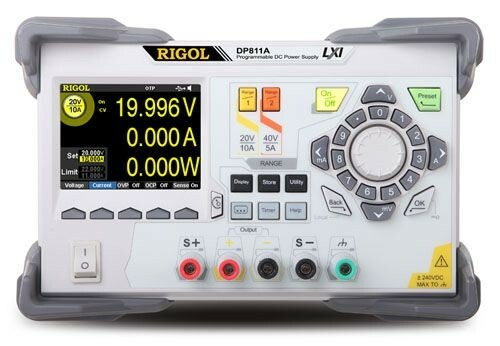 The DP811A Power Supplies combine the ability to source, analyze, and coordinate over time in a powerful new package. The DP811A has a single output with a 20 V / 10 A range and a 40 V / 5 A range for a total of 200 W. With the flexibility of the source users can reconfigure the instrument into any number of systems or applications. Built in V, A, and W measurements make power monitoring easy, but additional wave tracking, timing, and analysis features means there are even more ways to use the supplies. New digital triggering between instruments also makes it possible to reliably combine and connect supplies together. Intuitive to use for everything from education labs to the R & D bench, the DP800 family of power supplies provide incredible value for any application.